T-Pain, whose given name is Faheem Najm, is careful to note the vocoder-and-talk-box-laced legacies of Roger Troutman (of Zapp) and Teddy Riley (Guy, Blackstreet) in “Karaoke.” But there’s no question that he’s become synonymous with the suddenly ubiquitous Auto-Tune effect, which adds a distinct, delirious and decidedly sticky sound to his songs — many of them enormously successful. Although apparently Lil Wayne gets a pass for being a Friend of Pain, T-Pain is pretty annoyed that everyone else is stealing his sound, and he’s being forced to change up to stay ahead of the curve. 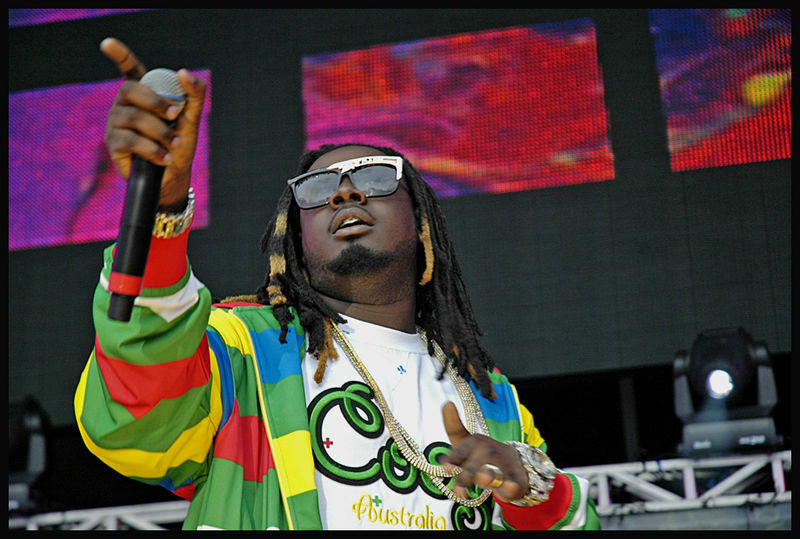 However, it’s definitely worth noting that T-Pain is awesome with or without heavy Auto-Tune. Arguably, the most interesting part of this story is how the software got its start. While pop music isn’t anything like rocket science, it took a geophysicist to figure out how to clean up wrong notes. Twenty years ago Harold “Andy” Hildebrand, who’d spent nearly two decades doing seismic data research in the oil industry, started a company, Jupiter Systems (since renamed Antares), that applied mathematical models and digital-signal processing technology to musical applications. Its first program was used to create seamless synthesizer loops. The idea for Auto-Tune came during lunch one day, when Hildebrand was jokingly asked by the wife of a sales rep to come up with an algorithm that might make her singing sound better. “We were discussing what I should do next, and she said, ‘Maybe you could make a box for me that would make my voice in tune,’ ” Hildebrand says from his Northern California office. “And everybody just stared down at their lunch. . . . Everybody knew it was impossible and was therefore a stupid idea.” So of course, he says, he had to do it. The result was a software plug-in that corrects a singer’s pitch, in a way that’s theoretically imperceptible to the untrained ear. “The automatic algorithm compares the pitch of the singer to a scale, then gradually moves the singer’s pitch toward the scale note,” Hildebrand says. Introduced by Antares in 1997, the Auto-Tune application was revolutionary. It reduced the need for — and expense of — doing countless vocal retakes in pursuit of a perfect end-to-end vocal; it also allowed singers (J. Lo) with pitch problems (Britney) to sound somewhat palatable (Cassie). So much so that Antares is releasing a discounted, stripped-down version of Auto-Tune this month to coincide with the release of T-Pain’s album. Whereas Auto-Tune plug-ins typically sell for more than $300, Antares is offering the Auto-Tune EFX for $99 through Guitar Center — “for the guy who wants a simple T-Pain effect or simple pitch correction,” Hildebrand says. This, of course, means more T-Pain copycats are inevitable. Some will be more famous than others: Sean “Diddy” Combs has already announced that his next album will feature a heavy dose of Auto-Tuned vocals, which actually sounds like an upgrade, given how monochromatic the mogul-rapper’s voice tends to be in recorded form. Christina Aguilera — a bona fide belter who doesn’t need the help — has hinted that she might experiment with the effect, too. Whatever. This style is already becoming overexposed and played-out, and its main practitioner is already moving on. But his glory shall remain. Just like RZA will always be the pioneer of using soul samples in hip hop, so will T-Pain long be revered for taking the Auto-Tune effect to the top of the charts. Pingback: Quezi » Do famous singers use electronics to “fix” their off-notes?